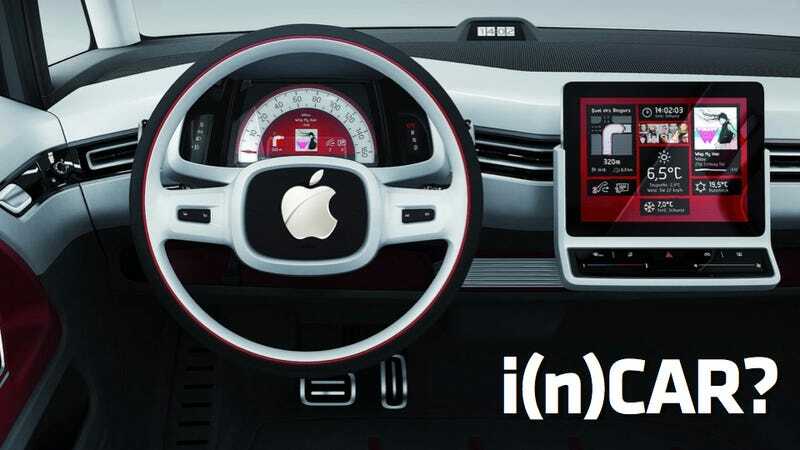 Apple's Hiring Automotive Engineers, Is An 'iCar' Infotainment System Coming? Apple is once again proving they're still the company Steve Jobs built. After years of saying "meh" to working with automakers on tighter integration of Apple products into automotive infotainment systems, there's evidence Apple is now hiring people to build a system for them that'll work with all their devices. The in-car infotainment marketplace is primarily split between people who already have existing deals with Microsoft to use their Windows CE-based Windows Embedded Automotive 7 system (Ford SYNC, Kia UVO, Toyota Entune) and those that don't (GM and the Volkswagen Audi Group, to name just a couple). Volkswagen's top executives did meet with Steve Jobs in 2007 to discuss ways the company could work together, but nothing has been publicly announced other than Apple products showing up in VW concept cars. Given Microsoft's almost full-decade jump on Apple in the space it's not hard to believe somewhere deep in Cupertino there's been a group developing their own car audio integration solution for automakers or customers (the idea of Apple building its own car, however, is ludicrous... at least at this point). But, a hint that Apple might be in the process of actually trying to build a version of whatever concept they might have developed comes via Car News China, who noticed a head-hunter posting in the automotive section of LinkedIn in China. The representative of Allegis-BN says Apple China is looking for someone who can fill the role of a Supplier Quality Engineer/New Product Integration supervisor with experience in CNC/die casting/stamping/plastic injection who knows Chinese manufacturing. That could mean they're looking for the kind of person you'd need if you were trying to manufacture a device to fit into a car dashboard — or that the type of person who knows his way around a CNC machine in automotive applications could translate that skill to other non-automotive uses. This could even just be the consumer electronics juggernaut of cool trying to build a prototype of a previously-developed concept. This is nowhere near definitive proof that Apple is entering the space, but it's certainly a big clue that they might be. And, since Apple is famously tight-lipped when it comes to discussion of future product until it's being boxed up and shipped out it's not like we're going to get official confirmation. For the moment we'll have to rely on rumors and clues like this one to determine the reality of an Apple in-car automotive infotainment system. Well, unless someone in China ends up leaving a plastic-injected or CNC-cut prototype center console in a bar. And if they do, let me be the first to say we know what to do when that happens.